The composition of the streambed and banks is an important facet of stream character, influencing channel form and hydraulics, erosion rates, sediment supply, and other parameters. Observations tell us that steep mountain streams with beds of boulders and cobbles act differently from low-gradient streams with beds of sand or silt. You can document this difference by collecting representative samples of the bed materials using a procedure called a pebble count. The basic technique is known as the Wolman pebble count. It requires a person with a metric ruler who walks through the stream, and a note taker who remains on the bank with the field book or survey data sheet. The note taker records the count is recorded by size classes or categories similar to those shown in the table below. 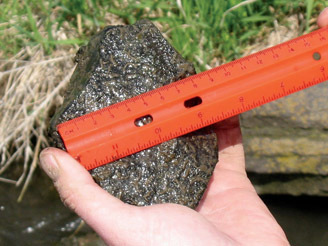 Pebble counts can be made using grids, transects, or a random step-toe procedure. Woody debris Sticks, leaves etc. Select the portion of the reach that you wish to measure (this may be the entire reach or riffles only). For stream characterization, sample pools, runs and riffles in the same proportions as they occur in the study reach. For other purposes, it may be more appropriate to use a random method, transects, or zig-zag pattern (See sample methods below). Most SOPs recommends collecting and measuring a minimum of 100 particles. Start at a selected point near the downstream end of the reach. Starting on the shoreline, take a step into the stream. Averting your gaze, pick up the first particle touched by the tip of your index finger at the toe of your wader. Measure the intermediate axis (neither the longest nor shortest of the three mutually perpendicular sides of each particle picked up). Continue across the channel in an upstream direction towards the opposite bank and repeat the process, continuing to pick up particles until you have the requisite number of measurements. Measure embedded particles or those too large to be moved in place. Note: A minimum of two people are needed for the procedure regardless of the method used. The note taker tallies by size class, always repeats the measurement back for confirmation and keeps count. Sample methods - There are several methods that can be used to perform pebble counts. The most straight forward approach is 1) traverse across the stream perpendicular to flow using 10-meter transects (for 100-meter reach), 2) use a zigzag pattern, or 3) stratify the reach according to bed features and them proportionately (i.e. % riffles, runs and pools). Click-here to download a field sheet, which includes general information, a data sheet and a basic pebble count ruler. Print, cut and laminate the ruler prior to your field work. The pebble count is one of a variety of methods that can be used alone or in combination to evaluate sediment processes in small streams. Others procedures include BEHI-NBS, erosion pins, monumented cross-sections, habitat assessment, keeping photo-logs and more. In 2006 WIB created a protocol that incorporates many of these methods. Click-here to review and download the procedures.